Select Shade Dual Prime is a dual-purpose, high-build specialty coating designed for priming and surfacing of metal and plastic parts. This primer helps prevent rust and seals out moisture while providing a base for topcoating. The RS-570 series boasts excellent flexibility and adhesion so it can be applied on both flexible and rigid parts. 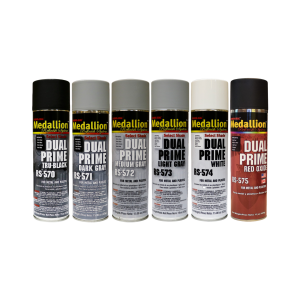 Dual Prime dries fast, has excellent build and is easy to sand. Paintable in 20 minutes. A 12 pack of narrow fan tips can be purchased under part number (RS-570-TIP). All Dual Prime aerosols are packaged in a 20oz. can.